For that reason, I’ve packed this post with my best and most actionable tips for 2019 so that you can learn how to live life to the fullest in the new year. I know that you can make this new year your best ever. Enjoy, and I hope this year is a great one for everyone. How to live life to the fullest in 2019! 1. Set 2019 goals and reach them. To make 2019 a great year, you’ll want to set goals so that you can live life to the fullest and reach your dreams. Those who set goals are much more likely to be successful than those who do not. Review the goals you set for the previous year and think about how you achieved them or why you weren’t able to. Make sure your goal is SMART. Write down your goals and objectives for 2019. Read further at The Best Way To Set Goals And Reach Success. The next time something negative is bringing you down, I suggest you try to remember all of the good things that you already have in your life. You already live a great life, and to live life to the fullest, you just need to remember that. This is the power of positive thinking at its best. You can be thankful for your family, friends, your job, a past experience, opportunities, and more. Smiling is contagious and is very important if you want to live life to the fullest in 2019! Studies have even proven that smiling can improve your mood, even if it’s a fake smile. Smile at the next person you pass, smile when you’re talking on the phone, smile when your loved one comes home, smile in an interview, and more. 4. Don’t be afraid of what other people think. If you want to live life to the fullest and on your own terms, then stop caring what other people think of you and your life. I used to really care about what other people thought of me, but I’ve been able to let go of that and now I couldn’t be happier. This has really helped me learn how to live a great life. The only person who should get to tell you what kind of life to live is you. 5. Create a budget in 2019. I have heard many people say that budgets are for boring people, but budgets can help you take control of your finances. That can help you reduce stress, allow you to reach your dreams, and start to live life to the fullest. However, not many people have a budget. Actually, only around 68% of households in the U.S. do not prepare a budget. This is sad because the average family carries a lot of financial stress. Most people have student loans, credit card debt, a mortgage, car loans, and possibly other forms of debt. Having a budget is crucial if you want to live a great life. 6. Spend less time watching TV. I talk about cutting back on TV a lot on Making Sense of Cents because the average person spends too much time watching televisions, 35 hours in fact! 35 HOURS! Can you imagine what you could do with even half of those hours every week!? TV can be a big time waster and can be detrimental if you want to live life to the fullest. We currently only have a digital antenna for TV, and we haven’t watched any TV since this past summer. We’ve been more productive, have spent more time exploring, and more! Instead of turning on the TV the next time you are bored or looking for something to do, you may want to do something more worthwhile, such as working out, spending time with friends and family, reading a book, and so on. Learning to be confident can be hard, but it just starts with reminding yourself about the things you are good at, the people who care about you, and how meaningful you are. Prevent you from believing in yourself. Lead to being too shy to do what you want or need. Force you to do things you hate. Cause you to ruin a meeting, a job possibility, and so on. On the flip side, confidence can open many doors for you, and it is one of the best ways to live life to the fullest. It can lead to getting the job you want, making more money, reaching your dreams, meeting new people, networking, traveling the world, and more. In 2019, I want you to start investing if you haven’t done so yet. It’s one of the best ways to improve your life for the future, and you can even start investing with little money. Being kind to others is something you should always be doing, and it will help more than just you live a great life. Being kind can open your mind to new people and experiences, it can help you stop dwelling on negative things in life, brighten someone’s day, and more. Say hello to every person you walk by today. Related post: 50+ Random Acts of Kindness. 10. Look for new ways to save more money. Looking for ways to save more money may allow you to pay off your debt faster, improve your financial habits, help you reach your dream sooner, and more. And, all of those things will help you live life to the fullest because you won’t be stressed out by your finances. Plus, there are many, many different ways to save money. You don’t need to sacrifice your favorite things or live an unhappy life in order to save money. It’s all about being realistic and finding a good balance between saving and spending. This is something that I am trying to get much better at because I realize that fear might be holding me back from being able to live life to the fullest. 2019 is the year to get over our fears and take more risks! Doing something risky every so often can get your heart beating and your adrenaline rushing. This can really make you feel alive and feel like you are in charge of your life. 12. Realize that it’s okay to fail. If you’re taking risks or trying new things, there is a chance that you may fail. The thing about failing is that it’s completely okay! Plus, you often learn even more about yourself when you fail than when you succeed. That’s because to overcome your failures, you’ll have to assess where you went wrong and how you can make it better. You won’t know if something will work or not unless you try it, and sometimes failure is just a part of the learning process. Part of learning to live life to the fullest is failing every now and then. Accept that fate now and you’ll be better prepared when it happens. 13. Exercise more in 2019. Exercising is great and it can improve your life because it can make you healthier all around, both your body and your mind. You will feel more confident, your mind will be clearer, you will be able to better cope with stress, and more. Whenever I’m feeling a little stressed out, tired, or even grumpy, I try to fit in a workout. I know that even a small workout is better than none, and it usually makes me feel so much better! If you have gotten stuck in your comfort zone or are avoiding new things and people, then you may want to try saying yes a little more often. Saying yes can open you up to more situations, help you grow as a person, and help you live life to the fullest. Sometimes saying yes to everything can make you feel like you are being walked on or spread to thin, and neither one of those feelings are good. If saying yes to everything is making you want out pull your hair out, then try saying no every once in a while. Saying no may allow you to have more time to focus on you and what you truly want from life. 16. Don’t let life pass you by. Sometimes we have to force ourselves to slow down and appreciate what’s happening around us so that we don’t let our life pass us by. Focus on living in the right now rather than thinking things like, “Oh, in 10 years life will be so much better because of such and such.” You’ll end up just letting your life go by without ever thinking about the present. Don’t wait 5, 10, or 20 years to start living your life, do it now! And, that doesn’t mean you have to spend all of your money doing so either. You can live life to the fullest by simply being present and focusing on the amazing things that are happening right now. 17. Cherish moments with loved ones. You should never take a moment for granted with those you love. Take time to see your family and friends, talk to them on the phone, tell you love them, and let them know that you are there for them. Your loved ones offer you some of the most amazing moments we have, and you just never know what may happen to you or them. This will help you live life to the fullest and will help your loved ones do the same. Paying off your debt can lessen your stress levels, allow you to put more money towards something else (such as retirement), stop paying interest fees, and more. Debt might be the thing that has been holding you back from being able to live life to the fullest, so let’s make 2019 the year that you finally start eliminating your debt! 19. Increase your credit score. If your credit score isn’t that great, then it’s important that you start trying to increase it. Your credit score is important because it can affect your interest rate, your ability to get some jobs, whether or not you are approved for a loan, and more. Fortunately, there are easy things you can do to increase your credit score. You should watch your utilization rate on your credit cards, pay your bills on time, watch the amount of hard inquiries on your credit report, and so on. Just a few percentage points can mean the difference of hundreds of dollars each month. That means you can wind up saving THOUSANDS each year just by increasing your credit score. You can check your credit score for free with Credit Sesame. 20. Don’t keep up with the Joneses. Everyone has experienced the feeling of wanting to keep up with others, whether you are five years old and want that new toy everyone is playing with, or if you are 50 years old and are feeling the need to upgrade your house, car, etc. The problem with this is that keeping up with the Joneses can actually make you broke and prevent you from being able to live life to the fullest. When trying to keep up with others, you might spend money you do not have. You might put expenses on credit cards to (in a pretend world) “afford” things. You might buy things that you do not care about. The problems can go on and on. 21. Stop letting money control you. If you want to gain control of your life and make 2019 the year you learn to live life to the fullest, then you need to gain control of your money. This means you need to stop worrying about all of the things that are holding you back, many of which are included in this blog post. 22. Do what YOU want to do. Go for that job you’ve always wanted, finally start a family, and make a plan to take that adventure you’ve been dreaming of. Whatever it is, just go for it! Now, I will tell you that to really live life to the fullest, it’s best if you do what you want to do on a budget! 23. Read as much as you can. Bringing out your creative side. Being positive is one of the best ways to live life to the fullest because it can change your outlook on everything. Being positive can help motivate you, it can help you waste less time on regret, and more. 25. Don’t waste time on being negative. You are wasting your time when you are being negative. Instead of wasting your energy on things like dwelling on regret and/or gossiping, you can be more productive by using this time for things that actually matter. By being more positive, you will be able to simplify and live life to the fullest. 26. Find free forms of entertainment. If you find that you are spending hundreds of dollars a month on entertainment, you should know that there are many ways to have fun for cheap. There is no reason to go into debt or add more debt to have fun. There are parks to explore, friends to visit, and more! 27. Get enough sleep each night. According to the National Sleep Foundation, the average person needs around 7.5 hours of sleep in order to “function at their best.” However, the average person actually only sleeps around 6.5 hours. Due to this, you should aim for 7-8 hours of sleep every night. It will help you be more productive, become healthier, and live life to the fullest. 28. Find something good in a negative situation. Even when something bad happens, there may still be some good in those times. Even though it can be hard to think about the positive when you are experiencing something negative, finding a small amount of positivity will help you live life to the fullest. Through the power of positive thinking, you can use a bad experience to learn something new about yourself, to realize you made a mistake, to come up with a new plan you never thought of before, and more. 29. Travel to a random place. There are many wonderful places in the world, and I wish I had the chance to explore them all. Traveling to a random place can help improve your confidence, open you up to new experiences, and may even make you a little uncomfortable, which is okay! Plus, doing something random will take you out of your comfort zone so you can live life to the fullest. 30. Create a bucket list. If you don’t have a bucket list, I recommend creating one in 2019! A bucket list is where you list all of the major goals you want to meet, places you want to visit, and things you want to do in your life. Creating a bucket list can give you the motivation you need to work harder towards your dreams, it can give you a sense of direction, and a great feeling of fulfillment as you cross things off of your list. Some people never get out of their comfort zone and explore the unknown because they are afraid of it. However, you’ll never know what your future holds unless you try new things and welcome different experiences. For example, if you want to leave your job for something else but are afraid of what may happen, one thing you might want to do is to make sure you have a well-funded emergency fund. This way, if it takes you a little longer to find your dream job or dream life, your emergency fund will be there to help ease some of the stress. 32. Be open to new things and tackle your fears. When was the last time you did something new? It’s too easy to get complacent when you actually need to branch out every now and then. 33. Become more organized in 2019. Being unorganized can waste a significant amount of your time and will prevent you from being able to live life to the fullest. It also leads to late fees, stress, lost items, and more. In a recent survey, 55% of consumers stated that they would save anywhere from 16 to 60 minutes a day if they were organized. 34. Be open minded to live life to the fullest. Being open minded is a great quality. There are billions of people in this world and everyone is different, so instead of judging others and expecting things to go one way, we should be more open minded. And, everyone can stand to be a little more open minded. Being open minded can help you accept changes, love others, be optimistic, learn from others, and most of all, it’s relaxing. Instead of worrying about what everyone else is doing, you can relax, have less stress, and just accept those around you. 35. Finally get rid of cable. The average monthly cable bill is over $100. By next year, the average cable bill is expected to be around $200 a month. We don’t pay for any form of TV (not even Netflix! ), and we LOVE it. 36. Drink more water to live a healthier life. According to Lifehacker, the average person should drink around 9 to 13 cups of water per day. This is just a baseline, though, as if you exercise or are in hot weather, then you should consume more. To drink more water, you can start by carrying around a water bottle, and you will be surprised by how great drinking water will make you feel. Here on Making Sense of Cents, I spend a lot of time discussing extra income, side hustles, side income, and how to make money online. I believe that earning extra income can completely change your life in a positive way. You can stop living paycheck to paycheck, start to pay off your debt, live life to the fullest, and more, all by earning extra money. In fact, because of earning extra income from my blog, I was able to pay off $38,000 in student loans within 7 months, I was able to leave my day job in order to pursue my passion, travel full-time, and more! While I don’t have a journal, I do have this blog, which acts as a journal in a way. Keeping a journal can help you reflect on your past, and it also allows you to see the progress you are making towards your goals and dreams. Plus, spilling your heart out every so often is great for your mind and soul. Related tip: If you’re looking for a life planner, I highly recommend checking out Erin Condren to see their selection of great life and monthly planners. This can be a great way to stay motivated so that you can reach your dream life! 39. Spend less time on social media. The average person spends many, many hours on social media each week, and it can prevent you from being able to live life to the fullest. Between Pinterest, Facebook, Twitter, Instagram, Snapchat, and many others, it can be quite easy to waste your entire day. If you find that you are spending too much time on social media, you may want to shut down the social media accounts that you are spending too much time on. You can even create a time block so you can’t access your accounts during certain periods of the day, and so on. Have less clutter. The bigger your home, the more likely you’ll have empty rooms that you feel the need to put stuff in. Now that we live on a sailboat, we are much more mindful of what we buy. We think about every purchase in terms of weight, size, where we can store it, and more. Spend less time on maintenance and repairs. If all other factors between two homes are the same (age, location, etc. ), a bigger home is more likely to take up more of your time and money due to more things breaking. 41. Have regular family money meetings. Talking about money and conducting regular budget meetings is an important task for every family and serious relationship to take part in. A family who has regular money talks and budget meetings is more likely to be financially successful and happier than a family who doesn’t. 42. Don’t be afraid of success. When some people become successful and reach their goals, they may sometimes start to feel guilty. I sometimes really dislike telling my friends and family how great life is and how much I love my business. I often feel guilty because I see how stressed out others are with their jobs, their debt, and more. But, I just need to remember that a mixture of luck and hard work led me to where I am. Everyone has their down points, and I had them as well. Instead of being ashamed, you should be proud of your accomplishments and success. 43. Have an emergency fund. An emergency fund is something that I believe everyone should have. However, according to a report by Bankrate.com, 26% of Americans have no emergency fund whatsoever. This same report stated that only 40% of families have enough in savings to cover three months of expenses, with an even lower percentage having the recommended six months worth of savings. This is frightening to me, as having an emergency fund can really help you get through tough parts of your life. 44. Stay motivated to save money. Even though I love saving money, I sometimes just want to spend money on any and everything. While the frugal life can be great, it’s not always easy. Some have large amounts of debt to pay off, others find it hard to stick to a budget, and more. Finding financial motivators will help you continue to work hard towards your goal, even when it seems impossible. Without motivation, you might give up on a financial goal quite easily. This is why it’s so important to learn how to stay motivated to save money so that you can live life to the fullest. 45. Stop being afraid of your past. Just because you may have failed at something in the past, this should not prevent you from aiming for your goals. I know people who have completely given up with reaching for hard goals because they weren’t successful in the past. However, that can rob you of the opportunity to live life to the fullest. How will you live life to the fullest in 2019? What tips on how to live a great life do you have to share with us? 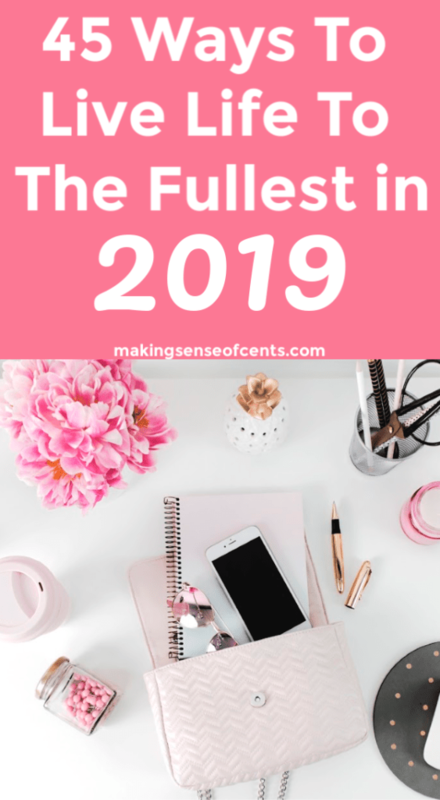 The post 45 Ways To Live Life To The Fullest in 2019 appeared first on Making Sense Of Cents.